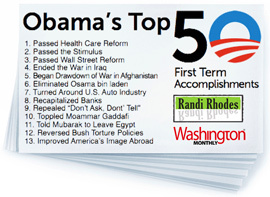 Shawn "Smith" Peirce's Work - Example: "Obama's Top 50 First Term Accomplishments"
Example from randirhodes.com: "List: Obama's top 50 First Term Accomplishments"
This example of cooperative work was a project Shawn coordinated with Paul Glastris at 'Washington Monthly' during the 2012 Presidential election. For the massive effect the project had - over twelve thousand likes/recommendations on Facebook, and thousands more downloads of the card file - the project was relatively simple. 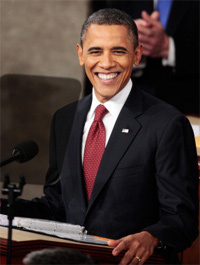 After getting agreement from Washington Monthly's Editor-In-Chief Paul Glastris, Shawn took Washington Monthly's list of 'Top 50 accomplishments of President Obama' and turned it into a wallet-sized card. As Randi would discuss the topics in the run up to the 2012 elections, she would remind listeners to download the cards, and use them in their daily discussions/arguments with their neighbors and friends. As confirmed by Shawn's contacts within OFA, and a few Redditors, these cards became a key on-the-ground organizing tool in some areas during the 2012 election. They were also a solid way to extend the brand of both The Randi Rhodes Show and Washington Monthly.